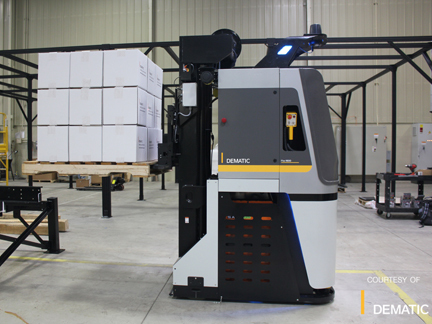 AGVs Automated Guided Vehicles, also referred to as AGVs, are an unmanned computer controlled, wheel based vehicle (also referred to as a mobile robot), that run on your plant floor or outside pavement. They are programed to carry loads within defined paths or areas, with navigation being achieved by several different means. An AGV system consists of five major components – 1) the Vehicle, 2) Host Software, 3) Wireless Communication, 4) User Interface, and 5) a Battery & Charger. Masted – are the most flexible of the types and resemble typical manual lift trucks. They can be fitted with standard lift truck attachments such as forks and clamps. Unit Load – compact vehicle that usually sits directly underneath the load and is able to interact with stands and conveyors. Tow Vehicles & Carts – also referred to as tugger vehicles, they usually tow up to 3wheeled carts. Reduction in Labor Costs– up to 100% labor reduction and overtime and turnover costs can be eliminated. How do the vehicles work in an AGV System? How do AGV Systems Work?